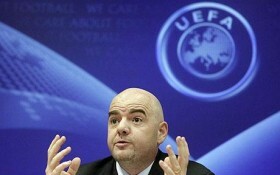 UEFA general secretary Gianni Infantino held a news conference on Wednesday after the UEFA Executive Committee meeting conveyed in Istanbul, Turkey, the country that rocked by its biggest match fixing scandal. Uefa General Secratary Gianni Infantino stated that Uefa relies on Turkish Football Federation’s (TFF) judgement on recent match fixing case Turkish football passes through and hinted the decision will be taken by TFF anf only by TFF. ‘ After TFF’s decision we will evaluate it, our [UEFA's] zero tolerance policy towards match-fixing will be implemented ‘ Infantino continued.